Some icy patches on trails in James Hunter Dog Park in Clarendon. Three days out from one of the D.C. region’s biggest snowstorms in years, Arlington officials say they’ve managed to clear most streets and county-controlled sidewalks — but the frigid temperatures of the last few nights have led to some trouble spots. “We have been having a lot of issues with refreezing over the past few days on both streets and sidewalks,” O’Brien wrote in an email. The problem was even significant enough to prompt the county school system to switch from a planned two-hour delay yesterday morning (Tuesday) to a full closure. When it comes to those troublesome sidewalks, the county puts most of the onus for clearing walkways on residents and businesses. But Arlington crews still have responsibility for sidewalks outside county facilities, like libraries and community centers. And on that front, O’Brien says that workers have managed to clear all the sidewalks the county is responsible for maintaining. The same goes for the walkways near county parks, according to Department of Parks and Recreation spokeswoman Susan Kalish. “We’ve got everything cleared at this point, but will continue to monitor things due to snow melt and refreeze,” Kalish wrote in an email. Of course, some slick spots still linger on trails within the parks themselves. Some walking paths remain iced over in parks around the county, prompting a few complaints from frustrated ARLnow readers. 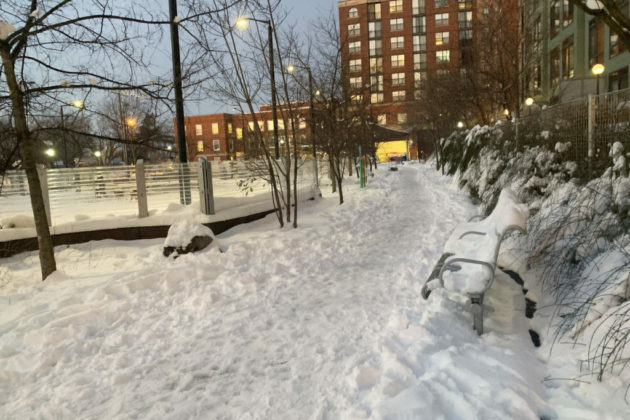 A quick survey of paths in both the James Hunter Dog Park in Clarendon and the Henry Clay Park in Lyon Park showed that ice still coated most of their walkways. Kalish added that parks workers also are responsible for clearing “10 miles of high-volume, multi-use county trails,” and that process is just about wrapped up as well. Notably, this was the county’s first storm since setting up a temporary salt storage facility to replace the old “Salt Dome” providing road salt for the northern half of the county — a controversial process that rankled neighbors this summer — but O’Brien says there were “no major concerns or unexpected issues” with the new facility. 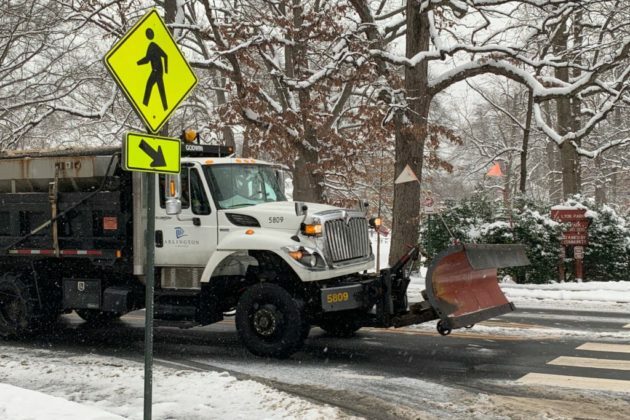 She added that the county’s “staffing levels for plow operators and snow-clearing personnel have remained steady,” despite Arlington’s recent budget woes, allowing the county to operate its full fleet of 46 snow plow trucks without a hitch. Going forward, O’Brien says that anyone who notices a street or patch of sidewalk that needs some work can report it for attention through an online form on the county’s website. And it might be a good idea to give any remaining patches of ice some attention sooner rather than later — forecasters expect a wintry mix to roll back through the area tomorrow night (Thursday).